DCU have progressed to the Fitzgibbon League Semi Final, with forwards Patrick Curran and Killian Doyle leading DCU to an inspired victory over LIT after extra time at St Clare’s last Tuesday. The pair scored 3-12 of DCU’s 3-20 tally as Eoin Roche’s side left it late to force extra time, with a last-minute surge from the team defeating a resilient Limerick IT side managed by Davy Fitzgerald. “We just kept fighting until the end which was the most important thing and we showed good attitude and resilience,” Patrick Curran told The College View. The Waterford ace scored 3-01 including a penalty in the dying minutes to lead DCU to victory. “A good result I suppose, it was important to get to a good start to the year and we’re kind of still building towards the Fitzgibbon (Cup). “We’re still down a good few lads but good attitude there tonight and a good win, hard fought,” Curran said. LIT were first off the mark with the presence of Peter Duggan causing havoc among the DCU defence. Lapses in discipline gave Duggan the chance to capitalise, as the Clare native pointed two frees in the opening minutes to give LIT the lead. DCU took control however, with a lovely Conor Burke score off the right being the first of a flurry of DCU points. Midfielders Liam Fahey and Fergal Whitely helped push the Glasnevin side ahead by four points in a ten minute spell that saw Whitely on target from play on three occasions. However, LIT were dangerous in attack and capitalised on sloppy DCU defending after 20 minutes when Shane Gleeson’s long ball aimed at Duggan wasn’t cleared, with the ball ending up in the DCU net past ‘keeper Cian O’Daly after a scramble in the box. Full back Jason McCarthy put LIT ahead with four minutes until half time after he was found on DCU’s 45 metre line by a beautifully floated ball over the DCU midfield, allowing the Clare native to drive the sliotar over with ease. 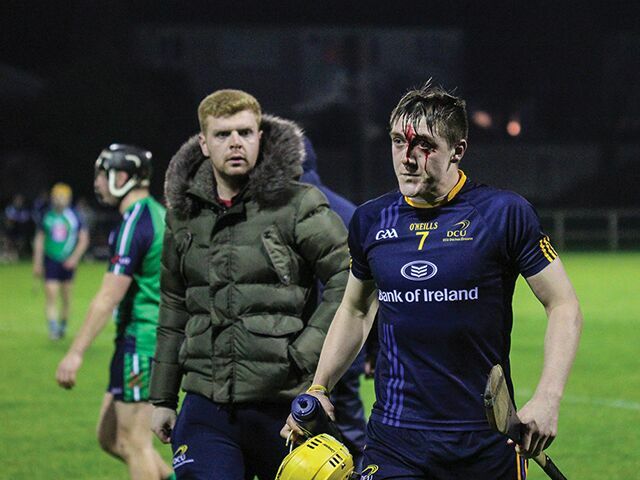 DCU struck back; a controversial Eoghan O’Donnell tackle on Peter Duggan allowed Roche’s side to clear their lines and a mammoth clearance found Patrick Curran on the break. The Waterford man finished emphatically into the right corner to restore DCU’s lead and help send the home side in 1-08 to 1-05 ahead at Half Time. The second half was a slow burner as the teams traded scores, with David Reidy on target for the Limerick men while Doyle and substitute Ciaran Dowling helped DCU retain their lead approaching the 45 minute mark. DCU went six ahead a minute later when Patrick Curran converted a penalty won by another substitute, John Donnelly. The Kilkenny man was dragged down after catching a long Conor Delaney ball on the edge of the box. The goal proved the catalyst to LIT’s revival however, Fitzgerald’s men scored the next five points without reply in a turbulent spell for DCU that saw the clinical Reidy punish DCU, the 23 year old scoring frees from deep in Limerick’s half on both the left and right flanks. Killian Doyle’s accuracy from dead balls kept DCU ahead marginally but it was Reidy again who pushed LIT into the lead one minute into additional time with his sixth from dead balls. Doyle was the hero however as he held his nerve to force the game to Extra Time with a last ditch 45 metre free to see it end 2-13 to 1-16. Doyle wasn’t finished; the Westmeath man’s two frees cancelled out a Reidy free before scoring a vital point in the dying moments of the first half of extra time with an excellent strike from close range to give DCU a 2-16 to 1-17 lead at the break. LIT raced ahead immediately after the restart, a quick break after the throw in saw Jason McCarthy through on goal as the DCU defence folded and he coolly slotted home past O’Daly into the right corner. DCU replied immediately with a Killian Doyle free but it seemed that Reidy just couldn’t miss as the Clare man restored LIT’s lead just a minute later with a monstrous free of his own. DCU refused to fold however, as John Donnelly equalised from close range with some lovely hurling to set up an intriguing final five minutes. A long shot by LIT centre back Sean Ryan looked to be dropping short into O’Daly’s hands but a wall of bodies in it’s way saw the ball drop beyond the DCU ‘keeper and into the net. With four minutes to go, a second goal of the half looked to have put DCU away. DCU came back, a tussle on the edge of the LIT box saw DCU awarded a penalty with just two minutes remaining. Patrick Curran once more stood up and drilled it into the left corner to level it again. Eoin Roche’s side dug deep in the closing moments and a point by substitute Johnny Barrett and an eighth free from Killian Doyle sealed a 3-20 to 3-18 victory over a defiant LIT.